Cross-frontier trade between countries in goods and services, with differences between countries in their COMPETITIVE ADVANTAGES (or ‘comparative advantages’) to supply particular products providing the basis of an international division of labour (location of production) and an associated flow of EXPORTS and IMPORTS between countries. International trade can bring both consumption and production gains to a country, serving to raise its living standards and improve its productive efficiency. International trade enables countries to consume some goods and services more cheaply by importing them, and also to obtain some resources and products from other countries which would otherwise be totally unavailable because domestic producers are unable to supply them (for example a scarce raw material or high-technology product). International trade promotes productive efficiency by encouraging a reallocation of resources away from areas of the economy best served by imports into industries where the country itself has a comparative advantage over trade partners. Inter-country variations in comparative advantage are reflected both in terms of their differential cost structures (i.e. price competitiveness) and different skill levels (i.e. product differentiation competitiveness). These, in turn, are determined in large measure by the country's basic factor endowments (natural resources, labour and capital) and degree of economic maturity (level of per capita income, general cost and price levels, scientific and technical skills, etc.). Resource availability and skills indicate the product range which a country is technically capable of supplying, while relative cost, price and product differentiation factors dictate which of these products it is economically appropriate for the country to produce, i.e. those products in which it has a comparative advantage over other countries. In its more simplified form, a two country – two product world economy the theory of comparative advantage generates the following international production and trade relationship: assuming country A is well endowed with cheap labour and country B is well endowed with capital (capital is cheap relative to labour), and that product X is labour-intensive and product Y is capital-intensive, then country A will have a comparative advantage over B in the production of X, while country B will have a comparative advantage over A in the production of Y. It follows that both countries stand to gain from SPECIALIZATION and trade: country A produces X and exports some of it in exchange for imports of Y, while country B produces Y and trades some of it for imports of X.
international capital movements and technology transfer, and relocation of production by MULTINATIONAL ENTERPRISES. For example, Malaysia developed a comparative advantage in the production of natural rubber only after UK entrepreneurs established and invested in rubber tree plantations there. Consideration of the benefits of international trade suggests that the optimization of such benefits is best achieved by conditions of FREE TRADE (i.e. the absence of restrictions on trade such as TARIFFS and QUOTAS), a view given operational validity by the international community by the establishment of the WORLD TRADE ORGANIZATION and the formation of various regional free trade blocs (see TRADE INTEGRATION). In practice, however, the benefits of international trade are often unequally divided between countries, and this inevitably tends to produce situations where national self-interest is put before international obligations. In 2004 the USA was the world's leading exporter accounting for 10.7% of world goods exports, followed by Germany 9.5%, Japan 6.5%, France 5.1% and the UK 4.3%. The USA was also the world's leading importer accounting for 18.0% of the world's goods imports, followed by Germany 7.4%, Japan 5.2%, UK 5.0% and France 4.9%. See PROTECTIONISM, FOREIGN CURRENCY, FOREIGN EXCHANGE MARKET, BALANCE OF PAYMENTS, DUMPING, IMPORTING, PARALLEL IMPORTING, COUNTERTRADE. Fig. 100 International trade. 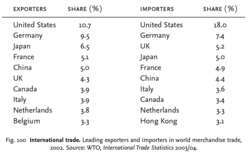 Leading exporters and importers in world merchandise trade, 2002. Source: WTO, International Trade Statistics 2003/04. a number of newly industrializing countries, Hong Kong/China in particular, are coming to the fore. It will be noted that the 10 leading exporters together account for 56% of total merchandise trade. On the whole, these same countries dominated trade in commercial service. Although trade between the industrially DEVELOPED COUNTRIES and DEVELOPING COUNTRIES continues to be important (based on an exchange of dissimilar goods, e.g. manufactures traded for basic foodstuffs and raw materials), this is now dwarfed by trade between the industrialized countries themselves (based on an exchange of similar goods, e.g. cars traded for cars - see PREFERENCE-SIMILARITY THEORY of international trade, especially Fig. 146). Another important feature of international trade is that while the export structures of the developed countries are characterized by a diversified range of manufactures, developing countries tend to be overly dependent for COMPARATIVE ADVANTAGE on one or two basic food commodities or raw materials. For example, the USA's leading export in 2002 (aircraft) accounted for 7% of its total exports and the UK's leading export in 2002 (oil) accounted for 4% of its total exports; by contrast, copper accounted for 82% of Zambia's total exports, coffee for 96% of Uganda's total exports, sugar and honey for 75% of Cuba's total exports and tobacco for 66% of Malawi's total exports. International trade has long been complemented by international investment as a resource allocation and transfer mechanism, but in recent decades FOREIGN INVESTMENT has become significantly more important, with the growth of the MULTINATIONAL COMPANY (MNC). MNCs typically use a mix of exporting/importing and jointly/wholly owned foreign direct investment in manufacturing plants and sales subsidiaries to obtain their input requirements and sell their products in overseas markets (see FOREIGN MARKET SERVICING STRATEGY). In consequence, MNCs have a powerful influence on both the total volume and direction of international trade. Cross-frontier trade is generally based on the COMPARATIVE ADVANTAGES that countries have in supplying particular products, providing the basis of an international division of labour (location of production). Inter-country variations in comparative advantage are reflected both in terms of their differential cost structures (that is, price competitiveness) and different skill levels (that is, product differentiation competitiveness). These, in turn, are determined in large measure by the country's basic factor endowments (natural resources, labour and capital) and degree of economic maturity (level of per capita income, general cost and price levels, scientific and technical skills, etc.). Resource availability and skills indicate the product range that a country is technically capable of supplying, while relative cost, price and product differentiation factors dictate which of these products it is economically appropriate for the country to produce, i.e. products in which it has a comparative advantage over other countries. The way countries have evolved as political states takes no account of their economic strengths and weaknesses. Through international trade, countries can capitalize on their economic strengths, thereby improving their real living standards. International trade can bring both consumption and production gains to a country. Such trade enables countries to consume some goods and services more cheaply by importing them, and also to obtain some resources and products from other countries that would otherwise be totally unavailable because domestic producers are unable to supply them (for example, a scarce raw material or high-technology product). International trade promotes productive efficiency by encouraging a reallocation of resources away from areas of the economy best served by imports into industries where the country itself has a comparative advantage over trade partners. Consideration of the benefits of international trade suggests that the optimization of such benefits is best achieved by conditions of FREE TRADE (i.e. the absence of restrictions on trade such as TARIFFS and QUOTAS), a view given operational validity by the international community by the establishment of the WORLD TRADE ORGANIZATION and the formation of various regional FREE TRADE AREAS. In practice, however, the benefits of international trade are often unequally divided between countries, and this inevitably tends to produce situations where national self-interest is put before international obligations, resulting in the unilateral imposition of protectionist measures (see PROTECTIONISM). In addition, the manner in which world trading patterns have developed has not benefited certain developing countries who have specialized in a narrow range of commodities for which world demand has grown slowly. A country's international trade dealings affect its BALANCE OF PAYMENTS, insofar as exports earn foreign exchange while imports require financing in terms of foreign exchange. The FOREIGN EXCHANGE MARKET acts as a conduit for the purchase and sale of foreign currency used to finance trade. A country's international trade performance will affect the value of its domestic currency when traded against other countries’ currencies, that is, its EXCHANGE RATE. See GAINS FROM TRADE, THEORY OF INTERNATIONAL TRADE, TRADE INTEGRATION, COUNTERTRADE, DUMPING. Hank Levine, Deputy Assistant Secretary for Asia and the Pacific, International Trade Administration, Department of Commerce. Leather Imports, (215) 228-6778, in Philadelphia, realized the potential of international trade while working as a sports agent in Cyprus, off the coast of Greece. He is a member of the District of Columbia Bar and co-chair of the International Trade Committee for the American Bar Association Section on International Law. There are efforts to get the issue before voters in November, which could include as much as $18 billion for transportation, including up to $6 billion for international trade, said Bill Allen, the LAEDC's president and chief executive officer. We found the ideal opportunity to extend the capabilities of our International Trade solutions into Asia with IPACS and its award-winning technology. In the huge Los Angeles County market, international trade is tops while agriculture and food-products manufacturing leads in Ventura County. Peter brings a wide range of experience within the government and working with industry on international trade policy and export controls issues. The Valley International Trade Association was founded in 1979 by several local business professionals and educators responding to the need to focus on issues in international trade. Over the past fifteen years, InterLingua has worked with hundreds of patent attorneys and in-house corporate counsel's on some of the nation's largest and highest profile patent infringement and international trade cases. OTCBB:FRLK) today announced that it has signed a contract with Guangxi CAEXPO International Trade & Logistics Co.
Southern California's economy is expected to show signs of modest improvement through 2005, with aerospace, international trade and tourism displaying the greatest strength, according to the Los Angeles County Economic Development Corp.
International Trade Association South Australia, Inc.